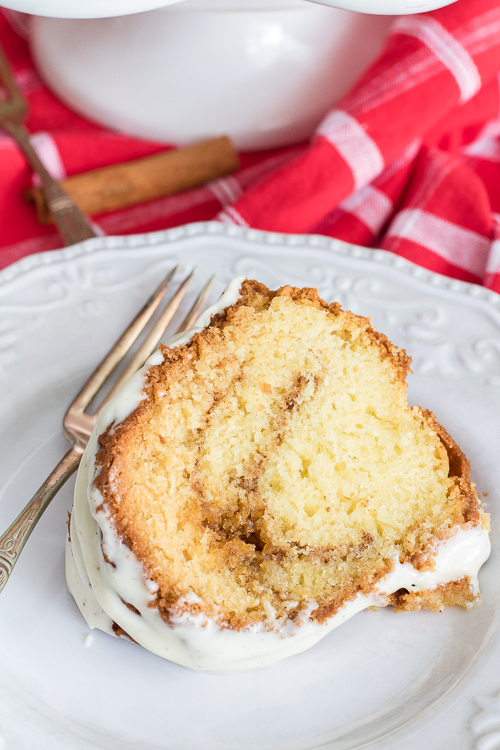 Easy Sour Cream Coffee Cake, is a yummy treat to enjoy throughout the day, no coffee required! 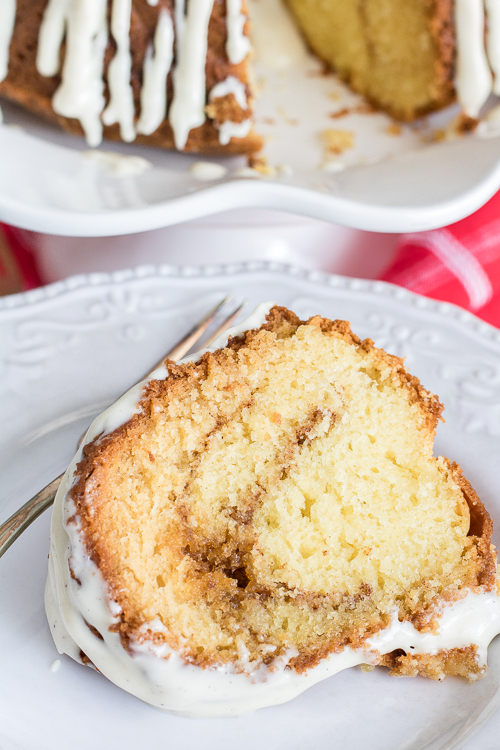 This recipe is the best sour cream coffee cake I have ever had, hands down. 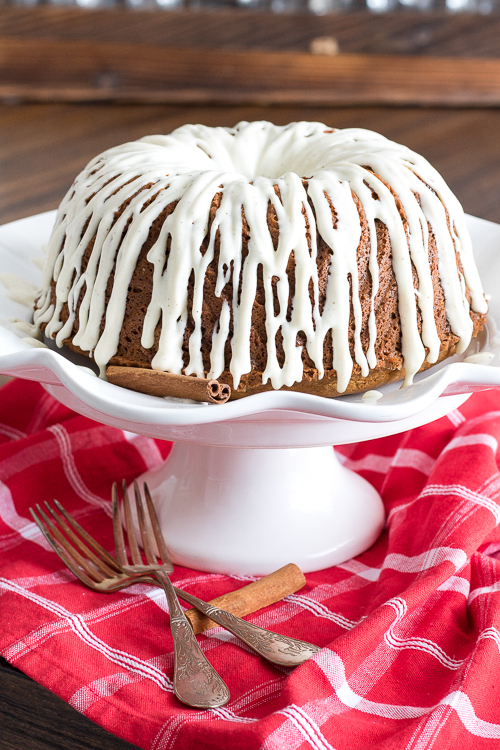 It is moist, bursting with cinnamon and topped with a killer cream cheese glaze! I have to be honest, I have never made one before, but I have eaten my fair share and this is by FAR the best I have ever tasted. I really think the secret to this one is using a lot of sour cream in the batter. Plus, I added a touch of almond extract to give it a little extra oomph and it sure did work, wow! Spray a bundt pan liberally with cooking spray, set aside. Mix dry ingredients in a bowl, set aside. Cream together butter and sugar. Add in eggs, vanilla, and almond extracts. Stir to combine, I used a stand mixer for this recipe but feel free to use a hand mixer. Slowly add the dry mixture and little at a time to the bowl, alternating with the sour cream until combined. Scrape the sides as needed. Make the brown sugar filling. 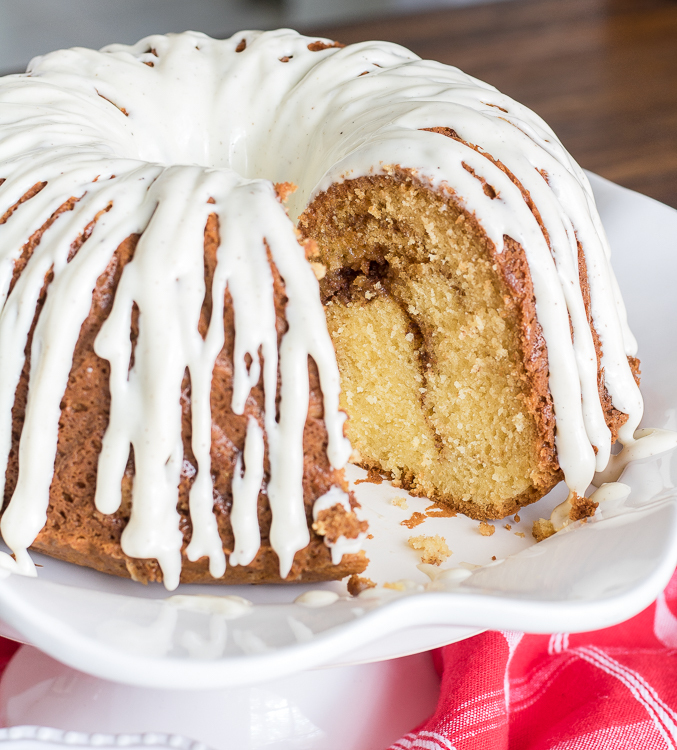 Pour 1/3 of the cake batter into the bundt pan and smooth out evenly. Sprinkle half of the filling. Pour another 1/3 of the batter and smooth, top with the remaining filling. Filling, pour in the last of the batter and smooth the top. Bake in a preheated 350-degree oven for one hour, until a toothpick inserted into the center, comes out clean. Place on a wire rack to cool. Let cool for 20 minutes and flip the cake out of the pan onto your serving platter, be very careful because it will be hot. 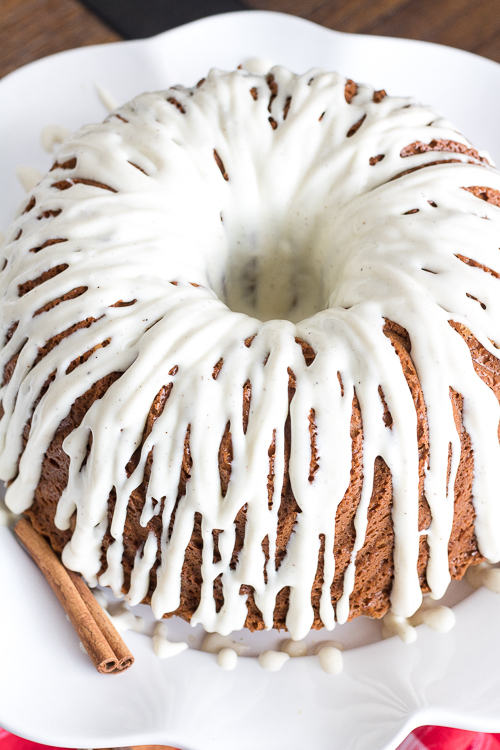 While the cake is cooling make the glaze consisting of cream cheese, powdered sugar, vanilla, butter, and milk. Pour on top of the cake and serve while still warm. I’m telling you, this glaze is a keeper! You will want to put it on everything! I really hope you enjoy this recipe, please let us know how it comes out in the comments below! For more yummy recipes, please visit my blog https://ThisSillyGirlsKitchen.com, see you there! Stir together the filling in a small bowl and set aside. Preheat oven to 350 degrees. Generously grease a bundt pan, set aside. In a large bowl, whisk together the flour, baking soda, baking powder, and salt. Set aside. In the bowl of a stand mixer (or with a hand mixer and a large bowl), cream together the butter and sugar until smooth. Add the almond and vanilla extract, stir to combine. Add the eggs one at a time until incorporated. Alternating between the dry ingredients and the sour cream, add both little by little until the batter is combined. Scrape the sides as needed. Pour 1/3 of the batter into the bundt pan and smooth. Sprinkle half of the filling. Smooth another 1/3 of the batter on top. Sprinkle the remaining filling. Finish off with the rest of the batter and smooth the top. Bake for 60 minutes or until a toothpick inserted into the middle comes out mostly clean, a few crumbs is okay, wet batter needs longer. 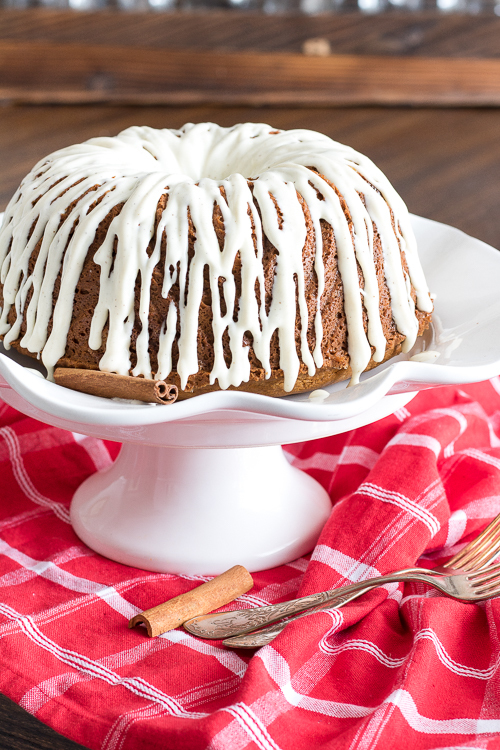 Place bundt pan on a wire rack and let the cake cool for 20 minutes. Carefully flip the cake out onto serving platter and let continue to cool. 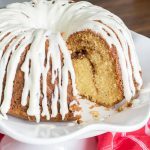 While the cake is cooling make the glaze by creaming the cream cheese in a medium-sized bowl with a hand mixer until smooth. Add the powdered sugar and vanilla, mix until combined. Add the butter, and mix. Add in the milk one tablespoon at a time until it forms the consistency you like, it should be thick but pourable. Drizzle glaze on top of the cake and serve. It's very good served warm, or let it come down to room temperature, enjoy!